On Wednesday nights in the summer, I usually go to free concerts in my local park and hear all sorts of wonderful music from all over the world. Of course, there's always a picnic involved, too. I always try to bring something that's naturally gluten-free so nobody makes comments about my dietary restrictions. (There's nothing more boring to talk about when eating a lovely meal than your food issues.) 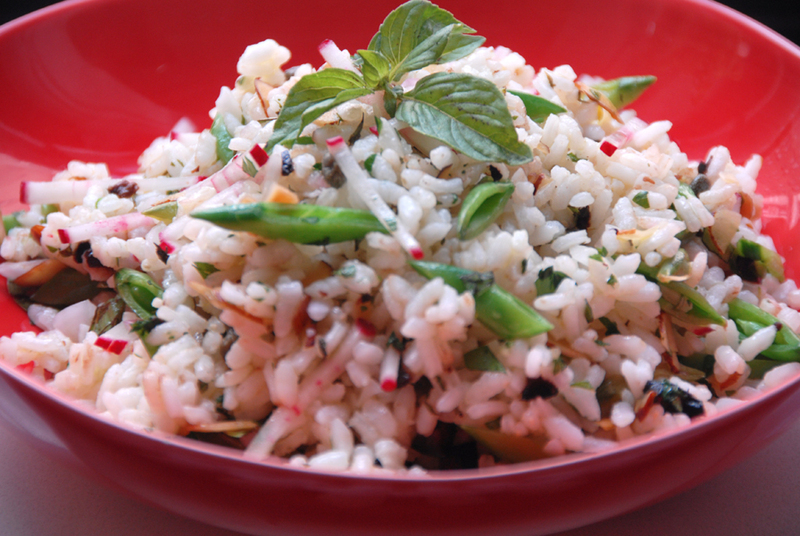 One of my go-to salads is arborio rice salad. Everyone loves it and it's something people don't always think to make. It's also a great salad to clean out the fridge. Shrimp would be a lovely addition to this salad. Improvise and substitute tomatoes for the peppers and pignoli nuts for the almonds, if that's what you have on hand. Artichokes and asparagus, work well, too. Combine 1 ½ cups of water and rice in a sauce pan. Season with salt. Bring to a boil and then simmer until the rice is cooked al dente—about 15 minutes. Meanwhile, bring a separate medium sized pot of water to a boil. Add salt and cook the snap peas for about 2 minutes. They should stay crisp. Remove, strain, and immediately put them in a bowl of ice water to stop the cooking. For the vinaigrette, combine the shallot, lemon juice, vinegar, and a pinch of salt in a small bowl. Whisk in the oil. When the rice is cooked and cooled, put it in a large bowl. Fluff the grains with a fork. Add the peas, capers, peppers, radishes, almonds and herbs. Drizzle the vinaigrette on top and toss lightly to combine. Adjust the salt, lemon juice, and olive oil, if necessary. You can add chopped fresh shrimp to this. Good main dish salad to bring to a picnic is a mediterranean arborio salad.